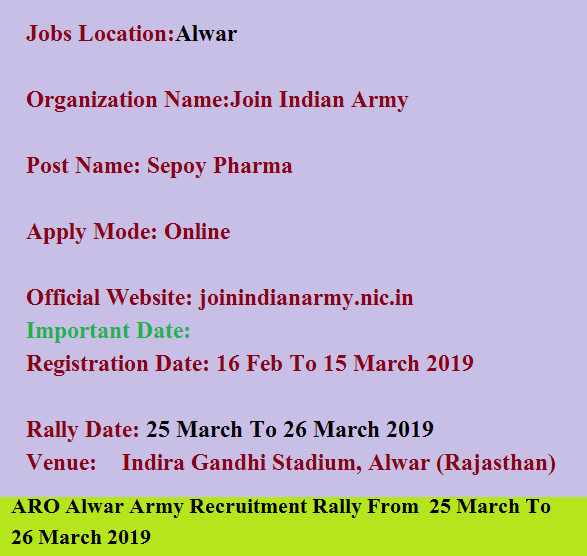 Army Recruiting Office Alwar Open Rally has released Notification for Sepoy Pharma Posts. 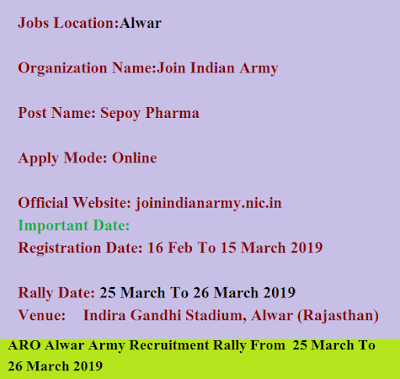 Applications are invited from eligible candidates can apply Online From 16 Feb 2019 To 15 March 2019.army rally from 25 March 2019 to 26 March 2019 at Indira Gandhi Stadium, Alwar (Rajasthan). months old Computer printouts / photo shopped photographs with NOT be accepted. recognised School / College / Board / University. head of the educational institution of concerned Board / University. “SIKH/HINDU/MUSLIM/CHRISTAIN” is not mentioned in caste certificate). School/College Principal/Headmaster where the candidate last studied. Sarpanch/Municipal Corporation within last six months. with photograph issued by Village Sarpanch / Municipal Corporation within last six months.